Before you know it, Santa will be on the chimney eager to deliver all his special gifts. What a better way to receive a Christmas package than in a very special Personalized Santa Sack?! Not only do I have this special project to share with you, but you can hop along to see 9 other inspiring gift wrapping ideas! I’ve been excited about this post for a while now. This was my first time using flocked heat transfer material with my Silhouette Cameo, and I have to say it is possibly my new favourite product. A velvet accent is exactly what this Santa sack needed! I first tried using fabric paint, but that resulted in a hot mess. The canvas has too heavy of a grain and it really seeped under the stencil. Creating a personalized Santa Sack was super easy. I used white Cotton Canvas from the Online Fabric store, each leather piece measures 6″x 1.5″. Below are the measurements before any seams are sewn. You can choose to sew a simple pillowcase style bag, or you can follow this tutorial to sew a circular bottom bag. Before you do do any sewing cut out the Silhouette Personalized Santa Sack Cut file and iron onto the middle of your canvas piece, that way the seam will be hidden in the back of the bag. You can also purchase the metal grommets at the Online Fabric Store, each bag will require 6 (instructions how to apply them are included in the package). For the bag closure I bought a 50″ piece of rope from The Home Depot for about $2, then threaded it through the grommet holes. 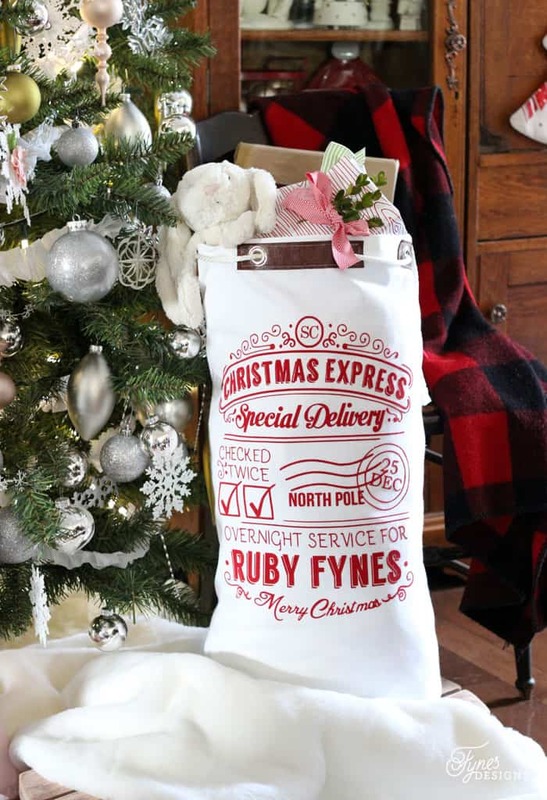 I absolutely love how these Personalized Santa Sacks turned out! I can’t lie, weeding the negative part of the cut file is a little tedious, but the results are so awesome I didn’t even care (I still went through with the second sack). 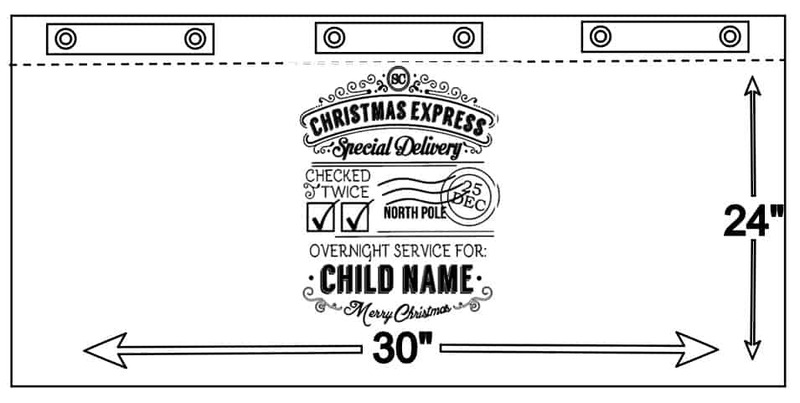 To complete this cut file you will need to download the free font Langdon , so you can insert the child’s name. Just right click the box where is says ‘replace name’ ungroup or release compound path and then insert the name. Be sure to mirror the name before you cut! The Overnight Service font is Bellota if that part of the file does not convert. NOTE: THIS CUT FILE IS FOR PERSONAL USE ONLY!! This file is available only for SILHOUETTE users! Oh WOW Virginia!!! Those sacks are unbelievably adorable!! Your kids will be able to treasure them forever! oh.my.goodness. I am in love with this!! I used the Silhouette brand, it worked really great! How do we get the cut file for the Santa Sacks? just click on ‘santa sac file” under the last bag photo. Oh My Goodness!! 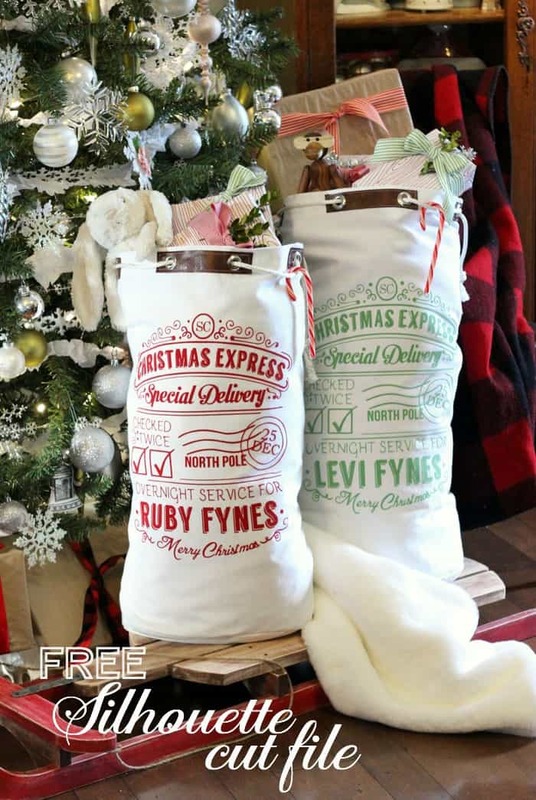 I am completely in LOVE with these Santa sacks! They are perfect!!! I think I’m going to have to make some. Thank you for the inspiration! These are amazing Virginia! I really really really need to learn how to use my Silhouette! Great project…you are endlessly talented my friend! Love the Santa sacks! Thank you. Those Santa sacks are adorable. I am fairly new to all things Silhouette but also use svg files in Corel…with this being v2 and I have DE, does that mean I won’t be able to use it? Anyone out there who knows how to convert for DE or create an SVG…thanks! Is there anyway you can send the file in an svg. or ai. format? I do not own a silhouette. Thank you in advance! Sorry Amy, I’m a Silhouette affiliate, and create files that work with their machine. Thank you for the Santa sack file, love it! These are fantastic. I really need to get my hands on a silhouette so I can do some fun projects like yours! I really need to get a Silhouette! I love the Santa sack! Thank you so much for the tutorial on how to do these….they are awesome! Fantastic! Thank you for sharing – YOU ROCK! Gorgeous job on the Santa sacks. All your decorations look incredible. Haven’t tried HTV but your project has really peaked my interest! What a treasure you are sharing! Thank you! So glad you found me Pam, Welcome aboard! I hope you enjoy all my ideas! Absolutely beautiful! Thanks soooo much for sharing this file!!! May I ask which font you used for the date? (25 DEC) Thanks so much! These are truly beautiful. I wish I could just buy the bag, it looks so great! Definitely trying the cut file! Thanks for sharing! Hmmmm…. every time I try to download this file, I get an error message? I get no application can open it. Did you try again? I haven’t had issues. These looks so great! What a cute tradition to start. Thank you so much for this! I just made one for my grandson, it came out fantastic! You are AMAZING! I have been trying to get the font downloaded to my fonts folder but it keeps telling me that it isn’t a true file. Any way you can help would be greatly appreciated. Not sure what the problem is! Where did you purchase the leather pieced? Too cute! I had leather scraps from another project (leather hide store) but you could get something at a thrift shop like a purse or jacket where you only need a few small strips. Thanks so much I am going to see if I can find someone to convert for me if that is ok? Thanks for sharing, how much HTV does this project require? I LOVE this! I’m trying to make it, but am having problems with them names. I have downloaded the font, but b/c the NAME has been moved and edited and grouped, etc., I can’t ungroup it to make it where I can fill in the name. When I create my own, I don’t get the layered effect. Did you do something special for that? Or did I miss part of the download somehow?? Any help would be greatly appreciated. GOT IT! I was capitalizing the letters and it was changing the look. Stopping by from the Best of Weekend link party. Love these sacks! I thought these were store bought, they look amazing! So impressed. Need to add this to my to-do list for next year. Pinning! Wow, the Santa Sacks are so, SO great!!! Love them!! This is adorable! Thanks so much for sharing the file! I just love these sacks. We celebrate christmas december 24 here in Sweden, and I would like to know what font you used for the numbers so I can change the date. Hi Helene, I don’t think the date was any special font. I think just Adobe Arabic. Good luck and Merry Christmas! i’m a little late to the party….however there seems to be something wrong with the download. i have tried 3 different times with no success. any chance you can assist me??? my grandson would love this! I just wanted to stop by and thank you for this file. I made one for my husband and it was a huge hit! Awesome! So glad you gave it a whirl!! OHHH I just tried again and it worked! 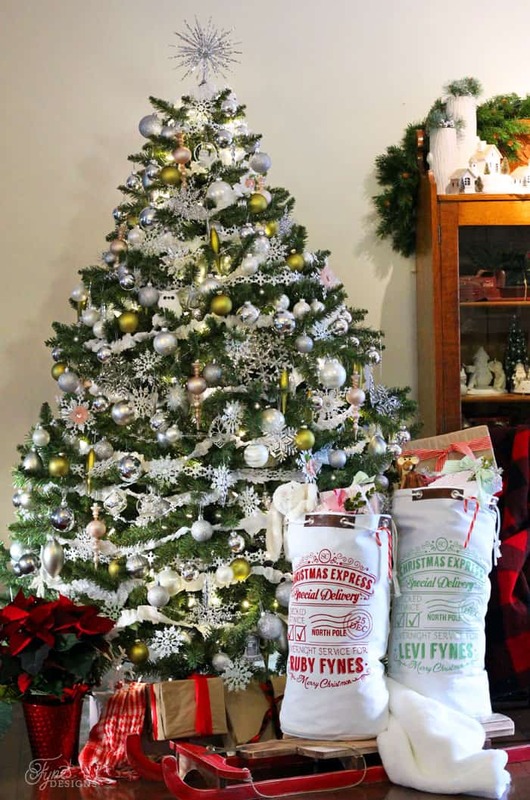 Yippee Thank you so much – love this sack and can’t wait till Christmas! How wide is the canvas off the bolt? I think 54″, but there are a lot of options. Thank you so much for sharing your wonderful Santa sack file. Definatly will be making these for Christmas 2015. My grandkids will love them. Thank you so much for sharing your Santa Sack. I am attempting make one and am struggling with the leather. Any tips or advice on the sewing of it? Yes I am using a leather needle and heavy duty threat, but unable to get the stitches right – I have change the setting on my machine to the longest stitch and loosened the tension. What did you use to hold it in place while you sewed? I would love to make this for my new granddaughter. Do you have the file in another format such as SVG? I don’t have a Silhouette, I have a cricut…thank you! thank you so much for sharing this , it is fantastic . going to have some happy nieces and nephews . Love this idea!!! hank you for sharing your beautiful work!! Thank you so much for the file! Excited to use it for my four children’s gifts this Christmas!!!! I realize I’m almost a year late to this party, but these are AH-MAY-ZING! By far my favorite. I would have been more than happy/willing to pay for this design! Thank you so much Ashely! xo, be sure to follow along for more freebies! The Santa bags are amazing. Would it be possible for you to post in SVG file? I have Cricut Air. I’m sorry Vickie, I’ve created the file as a Silhouette team member, so I can’t convert it. This is amazing Virginia! Now on my to do list for Christmas as well! I just wanted to let everyone know I used a deep red pillow case and white flocked vinyl and they are beautiful. However, that isn’t the purpose for my post Virginia. I wanted to let you know I bought the image (exactly the same) but it’s an svg from an etsy shop last week in case you want to know. I am embarrassed to ask, but how do I break the name apart to change it? Literally, I’ve only had my Silhouette a little over two weeks. Really wish there was a “school” here in my town to learn how to use it. Thank you Virginia. Did you use a heat press or just an iron? Just an iron. Our basement actually flooded and they made it through a lot of water damage with no issue! Hi Kim, I’m sorry I can’t really remember how I did it, Fold the fabric in half and measure which should give how wide the circle should be? If you google a circular bag it should give you some tips. Sorry it was so long ago! I downloaded your amazing file a few weeks ago and told my friend about it… but it seems like that file is no longer available on your website? Is there just something not working or did you delete it on purpose? It should still be there! I just came across this post and can’t find where to download. There’s one spot but it opens asking for payment and I’m not comfortable putting a credit card in a pop-up window. 🙁 Beautiful file though! Thank you so much. This is adorable! I wanted to just say thank you for this idea and the files you gave us! I made two small bags for granddaughters and they loved it! Thank you! Hi – is this still available? I keep trying to find the svg file and I cannot find it. Am I looking in the wrong place? Thanks! I just found your blog via Pinterest and I love these bags. I made two for my grandchildren. It was my first time using my heat press. They turned out great, using your tutorial. I did leave off the leather. I put the leather on the bags, but could not put a hole through it for the grommet, so I just took the leather off. Thank you for the beautiful design. So happy to hear! Hope you had a wonderful holiday! Can you please send me this cut file? I can’t seem to get it…it says I need permission? I’ve tried everything. is there anyway to still get the free file? This is so adorable. I tried to click on the link and it takes me to a google page and says I have to ask for permission to access the file. Is there a way you can re-link it?